Chicago may be urban, Midwestern, hardworking. But it’s not often celebrated for its lighter side on the east: a sparkling lake sprinkled with sailboats. Though when you think about it, sailing here makes perfect sense. We are the Windy City, after all. Yes, we do have a great baseball team in Chicago. OK, two. (Pay up now, Sox fans!) Yes, we are known for deep-dish pizza and really tall buildings. Yes, we are a springboard for shooting-star comedians and possibly our next president. Our City of Big Shoulders, our City in a Garden, our Windy City holds many claims to fame. But Chicago gets little credit for one of its best assets: miles and miles of coast. There’s not a speck of land visible on the horizon across Lake Michigan. Glittering blue water rushes against hot sand populated by Chicagoans feverish to soak up sun before winter returns, before the snow settles in and that same wind blows our eyelashes into the freezing tears streaming down our icy cheeks. We’re giddy here in summer, packing countless street festivals for cheap sangria and dining on patios next to six lanes of smog-spewing traffic just for the pleasure of eating outside. The city embraces every opportunity to breathe somewhat fresh air. And nothing is as breathtaking as skimming its shore in a sailboat. There’s a huge sailing community here, supporting numerous harbors and yacht clubs. We even have a few 70-footers slicing our waters. It’s not what you’d expect, perhaps, from a place that makes a big fuss about ketchup on hot dogs. But our competitive sailors stand tall in races on the East Coast and around the world. 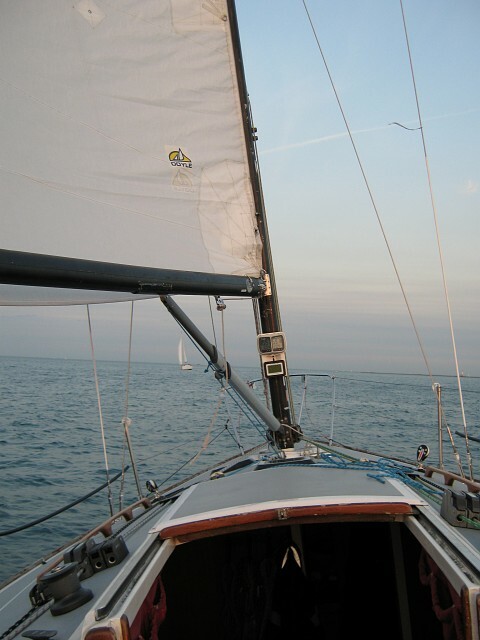 Sometimes, if you’re lucky, you are invited to join them in an evening sail on the lake. The sailors leap into their choreographed ballet of ropes and cleats and unfurling and cinching, everyone with a purpose and a position, slipping around each other, until the sails breathe deeply and the sailors can sit down. As that famous wind whips your hair and pushes the boat, the city softens in the setting sun. It glows, then fades, and finally glitters in the dark; silver sequins against the black velvet of the lake. You can almost imagine you’re on any coast, so cosmopolitan and extraordinary it seems. But this unique view of those really tall buildings, that unmistakable skyline reminds you that it’s good to be in sweet home, Chicago.